Whether you’re at the office, going to a special event or even attending a wedding, you want to look your very best. Although we explore each of these dress codes in great detail, it’s important to dedicate time to the shoes. Interested in a particular pair? Just click on the link above to jump right to it! Afterwards, we’ll also take a look at the criteria that defines dress shoes and what will increase or lower their level of formality. Short on time and want to make a quick decision? Confidently use our Quick Buyer’s Guide below to head right to the retailers and start shopping straight away. Otherwise, scroll down to read about them all. What Are The Best Dress Shoes For Men? Those seeking the very best quality won’t be disappointed by Allen Edmonds’ beautiful Oxfords. Their flagship shoes feature a classic balmoral cap toe but with a touch of broguing for a subtly elegant finish. 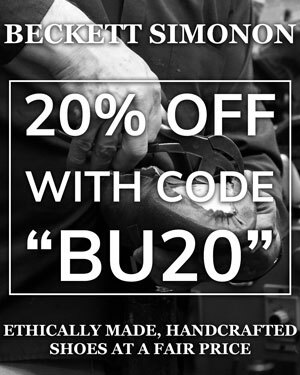 Furthermore, their fully-welted construction features our favourite Dainite soles! A firm fixture in business professional wardrobes, these Oxfords have an extra element of flair that will add elegance to your attire. Therefore, don’t hesitate to make your suit special with further details such as double cuffs and pocket squares. Furthermore, these shoes would work well with cocktail attire too. Available in either black or brown, we’d say that the former is the better choice for these shoes. Brown Oxfords are a devil to incorporate into formalwear as a closed-lace throat and brown leather are something of a sartorial oxymoron. If you want brown shoes, opt for Derbies instead. Although not a specific shoe, we love the opportunity offered by Undandy to create your own. Using their advanced yet intuitive 3D interface, you can create your perfect pair through in-depth customisation. Change anything from the leather uppers and quarters to the very stitching colour to your heart’s content! How you choose to wear your custom shoes depends very much on how you design them! Your options range from conservative to some of the wildest possibilities that you could even imagine. The sky’s the limit regarding the colours available. Not only can you choose between a variety of calf leathers, patent leathers as well as suede and canvas, but each have their own ranges of colours too. Furthermore, you can customise each section of the shoe to create spectators or saddle shoes if you so desire. One of the most versatile shoe designs we’ve ever worn, Allen Edmonds’ Strandmoks are wonderful shoes. With a distressed brown leather construction that contrasts with a tan welt and terracotta soles, they turn heads and feel great to wear. If cleverly paired, Strandmoks can go with just about any dress code up to cocktail attire. From jeans to chinos, they’re great for casual and business casual wear. However, they also look great with a rustic-style vintage suit or even elegant tweed . The Strandmoks are only available in brown. However, the shoe itself is a palette of various hues from the distressed calf leather to the tan welt and red soles. You can also switch between tan and red laces, which are both supplied with them. Wolf & Shepherd claim to have created the world’s most comfortable Oxford shoes and the hype isn’t for nothing. With a padded interior, they’re effectively dressy sneakers. These are the perfect shoes if you’re standing all day! Just like the Fifth Avenue by Allen Edmonds, the Closer Cap Toe Oxfords are decidedly business professional. Their more understated design renders them a more classic choice ideal for business wear or more formal occasions. We’d normally advise that you only get Oxfords in black. However, we’re quite fond also of the mid-brown “maple” as well as the tan “honey” offered by Wolf & Shepherd. Consider your needs before making the choice. 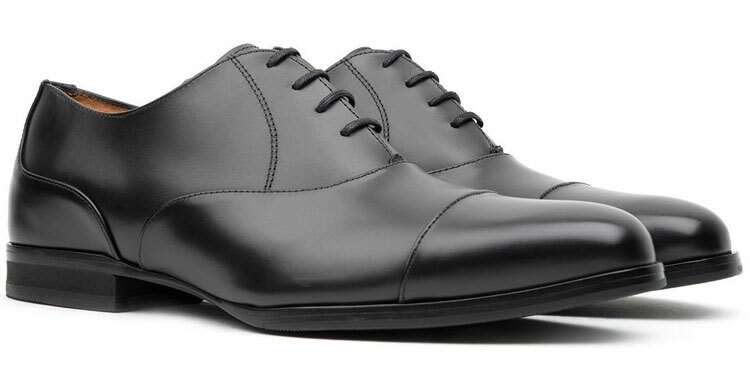 If you’re just looking for a pair of Oxfords for work, black would be the safest. For the boot fanatics seeking something that they can wear for dressier occasions, we couldn’t recommend the Sullivan Street by Allen Edmonds enough! With a smooth calfskin upper and Oxford cap toe, they’re ideal for business and cocktails. 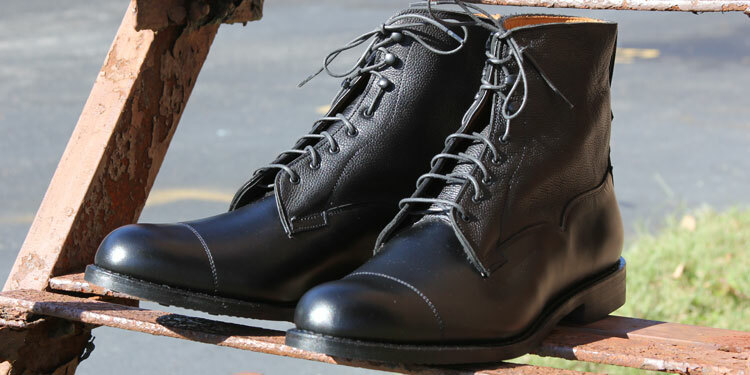 Meanwhile, the quarters and uppers of the boot are a pebbled leather that adds a touch of flair to the boots. This makes them great for business but just as eye-catching for cocktail attire. Add some matching flair in your suit to really stand out! Available in both brown and black, we’re particularly fond of the latter. The black leather looks great when pebbled and the smooth calfskin is reminiscent of a classic Oxford so that the boot doesn’t appear too unorthodox. 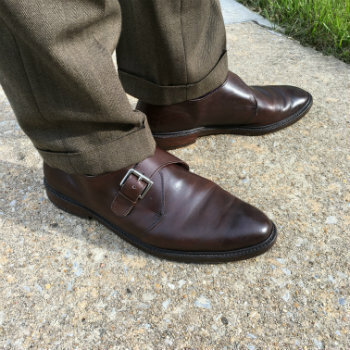 Monk straps are a growingly popular shoe style. However, it’s hard to find a quality and original design that is worth the money. That being said, we’re quite fond of Johnston & Murphy’s elegant single monk strap shoes that feature elegant perfing and other broguing details. Hovering somewhere between business casual and business professional, these shoes are an elegant and laid-back design that should be worn with confidence. Consider styling your attire with a touch of avant-garde eccentricity to really stand out. Although also available in black, we particularly love this shade of brown. Being hand-stained, there’s a unique depth of colour that looks great alongside the brogue ornamentation. An unapologetically Italian style of shoe, wholecuts are elegant and streamlined for those that love understated elegance. Massimo Matteo’s approach is a crisp and flashy shoe that holds back on details to create space for the leather to be admired. 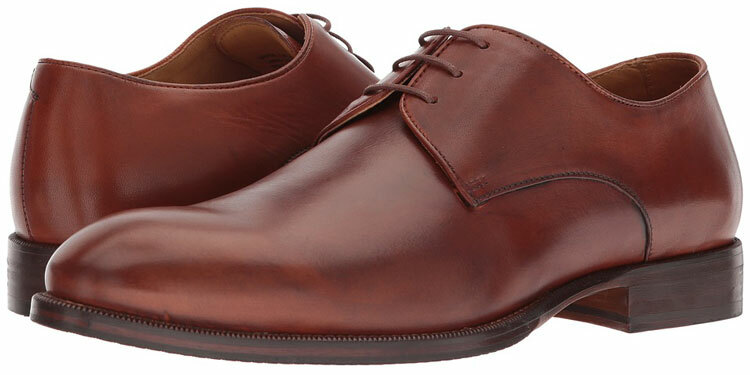 A dressy alternative to Derby shoes, we love how wholecuts can be worn in brown but be elegant enough for formal wear. Consider pairing these shoes with a natural-coloured suit or even with a mid-grey for a debonair continental look. Although available in black, the textured brown leather offers an extra level of visual depth. Furthermore, the brown leather will be easier to style with a variety of different outfits whilst the black may be quite challenging. If you’re looking for dress shoes that are a little less formal and more relaxed, the open-throat cut of Derby shoes are a great choice. Made in Portugal, Vince Camuto’s Derby shoes are elegant and comfortable as well as a fine example of this style. 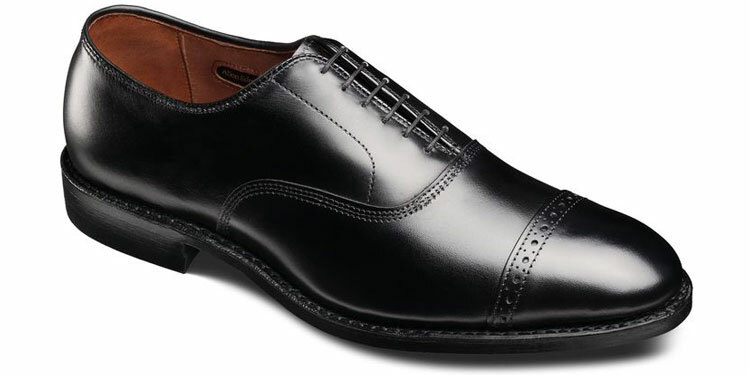 Derby shoes are quite versatile and can be worn with anything within and beneath the business professional dress code. However, their construction isn’t overly formal and you may struggle to integrate them into other, more lavish occasions. We’re very fond of Vince Camuto’s burnished cognac finish. Although they’re also available in a dark brown woodbury or black, the cognac have an extra touch of flair, which makes them the most stylish option. It’s always worth investing in a special pair of shoes for your most formal events and gatherings. 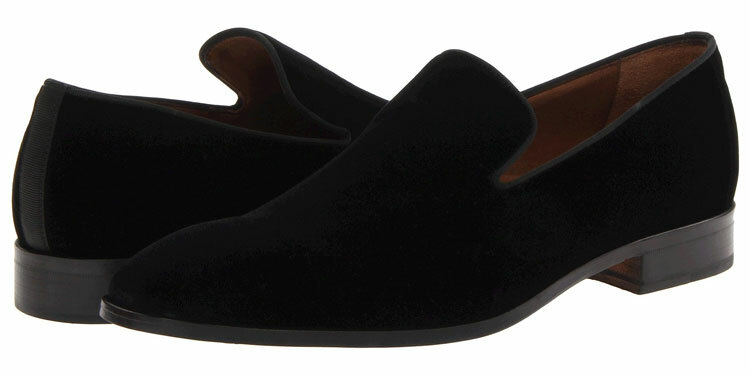 Whilst patent leather is a great choice, why not opt for an elegant pair of velvet tuxedo slippers? Exceptionally classy, velvet slippers are slowly regaining traction as popular footwear for formal occasions. You wouldn’t wear these for the office but they’re worth keeping aside for black tie events or even cocktail attire. Although the most acceptable choice is black when attending black tie events, some velvet slippers can be found in other colours. For instance, you could always opt for a deep purple or midnight blue to add a splash of colour to your style. Sometimes we can’t all afford lavishly elegant shoes. There are other times that we want a pair of shoes just to wear once or twice. Therefore, if you’re on a budget, you can’t do much better than Samuel Windsor’s classic Oxfords, which manage to feature a Goodyear welted construction under $100! 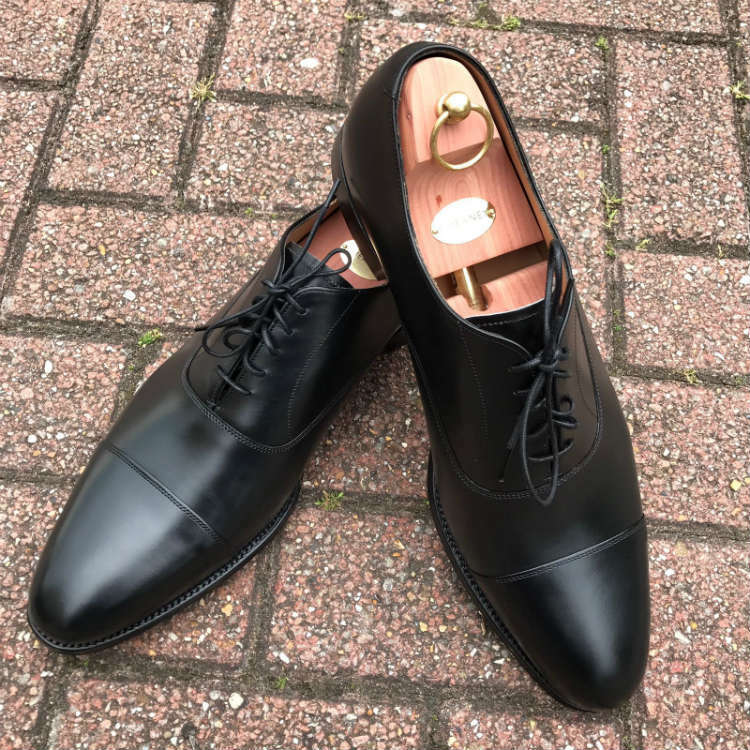 Perfectly acceptable for a range of formalities, you can wear these Oxfords for the office and even special occasions such as weddings or funerals. If you’re someone who rarely wears a suit, these are the best possible choice for your back-up formal shoes. Although also available in brown, black would be the best and safest choice. If you’re just going to be wearing these shoes for the office or the odd special occasion, black leather will be far more useful than brown. What Defines Formal Dress Shoes? Dress shoes aren’t simply defined by a single characteristic but a multitude of various considerations. Below, we’ll take a look at the contributing factors that render a shoe dressy or not. You can use the guide below for dress shoes but for a general overview, you can refer to our full shoe formality guide. Firstly, the extent of which a shoe can be considered “dressy” is by how functional it would be in everyday life. In short, the least versatile shoes that fulfil no practical role are considered the most formal. Meanwhile, shoes with an utility function such as most types of boots and shoes that can be worn outdoors are the most casual. For instance, sneakers are for athletes, boots are for workers and so on. However, there are exceptions to this rule. Take the example of Brogue shoes that were originally designed with perforations that improved drainage when walking through marches. This style has been largely appropriated by the ruling class and today is relatively dressy. Nevertheless, it has retained its outdoor connotations and is therefore one of the least formal dress shoes. Conversely, delicate opera pumps and tuxedo slippers are wildly impractical for wearing outdoors. They are therefore restricted to the city and indoors and would be unimaginably useless in a more rustic environment. As such, they are considered more formal because their use can only be reserved for special occasions that expect the wear of exceptional garments. 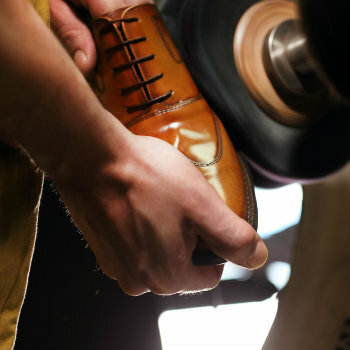 Regardless of style, the leather and material used to make a shoe will play a very significant role in its formality. In many ways, this ties to the previous consideration as the most rugged and resilient materials are considered the least formal. Meanwhile, delicate and pristine materials such as patent leather and velvet are the most formal. These are usually reserved for the most exceptional dress codes and will be rarely worn on a daily basis. 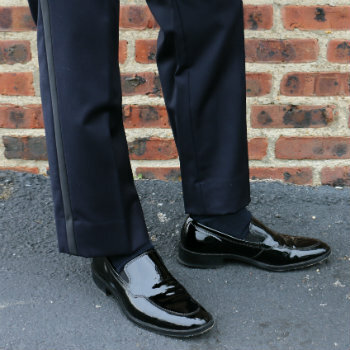 For example, it would look particularly odd to see a regular business suit paired with patent leather Oxford shoes. However, you can go with smooth calf skin shoes for them to be considered dressy depending on the circumstances. As a general rule, the rougher the material, the less formal it becomes. Once you begin wearing anything that isn’t smooth leather such as pebbled leathers, canvas and suede, things can become very casual indeed. The same can even be said for soles. As rubber soles are cheaper and more practical on a daily basis, they’re considered much less formal. When dressing up for formal occasions, it may be expected that the soles are leather instead. In fact, the choice of leather can have a profound impact on the shoe’s formality and even override the style’s initial level of dress. For instance, suede Oxfords (if such a thing exists) become much less formal than calfskin Derby shoes. Finally, shoe colour is another factor that we delve into in great detail on our shoe formality guide. In short, the darker the colour, the more formal it is. With black being at the top as the most formal colour choice, you can work your way down to dark brown and cordovan as mildly less formal options. As you begin to find yourself in medium browns and tans, the colours are considerably less dressy and begin to become quite casual. Once into typically non-leather colours, such as white, red and greens, you’re immediately in a decidedly casual dress code. Simply use the links above to jump to a particular shoe style and learn more about it. Although several different styles, the most formal shoes are the least practical as explored above. 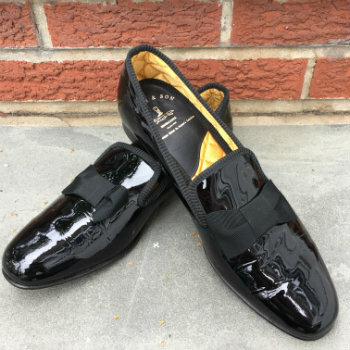 Made from either patent leather or velvet, tuxedo shoes are sleek and elegant with a delicate touch. Some tuxedo shoes, known as Opera Pumps, even feature a decorative bow across the top. 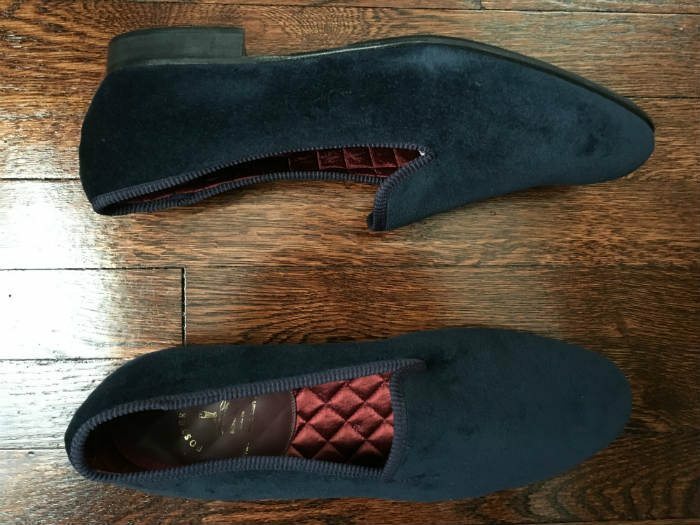 Meanwhile, tuxedo slippers are simply velvet slippers with a leather sole. You can learn more about the different types of tuxedo shoes with our dedicated guide. A staple shoe style reminiscent of Wall Street and the City of London, Oxfords are a classic and one of the most formal styles out there. Although mostly defined by their closed-laced throats, they will often feature a cap toe. 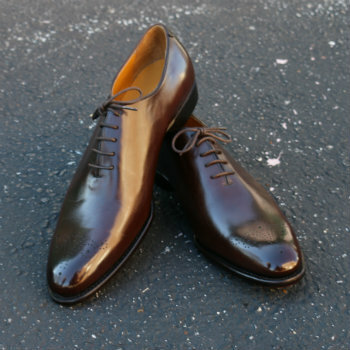 The cap toe is an extra piece of leather that’s stitched over the toe area, which is often buffed into a fine sheen. Sometimes, they can even be given a mirror shine. Also known as Balmoral shoes, they can be worn for just about anything including and above business professional. For instance, a patent leather Oxford is ideal for particularly formal events including White Tie. Learn more about this shoe style with our guide to Oxford shoes. Technically a type of Oxford shoe because of its closed-lace throat, a Wholecut is considered a debonair and elegant style. They’re often quite formal as they’re made from a single piece of leather, which must be of premium quality in order to work. Overall, wholecut shoes are quite expensive as despite using less leather, the craftsmanship is very demanding. Therefore, they’re also quite rare to find. Reminiscent of Italian styles, they’re a relaxed alternative to Oxfords and somewhat flashier. You can learn more about this particular style with our dedicated wholecut shoe guide. Featuring either one or two buckles, monk strap shoes are a firm favourite among the most style conscious men. Today, double monk straps are the most popular. However, both are influential shoe styles. Monk strap shoes can greatly vary in appearance with different areas for placing the buckle as well as the materials used. More rustic styles will be inherently more casual. Meanwhile, you can find black monk straps with very fine straps that are more elegant and thus more formal. You can learn everything about this shoe style through our detailed monk strap guide. By definition, boots are a type of utilitarian footwear. Therefore, they’re considered generally less ornamental and more casual because of their practicality. However, as we’ve said, you can render a style of shoe dressier depending on its construction and choice of leather. Typically the most formal boot style are Chelseas, which are a recent style popularised by The Beatles in the 1960s. However, we’ve instead featured lace-up dress boots above because their construction is reminiscent of Oxfords with their calfskin cap toe. An old Scottish classic, Brogues are highly-decorative shoes that feature ornamentation known as pinking and perfing. When speaking generally, these terms fall under “broguing” as they’re so intertwined with the shoe style itself. Originally, brogues were peasant shoes and the perforations were functional in that they helped water drain off the shoe rather than soak into the leather. Therefore, they’ll always be more casual than formal dress shoes. Nevertheless, their level of formality can largely depend on the leather and lacing system. For instance, you can find open-throat Derby-style brogues in suede, which are decidedly laid-back. 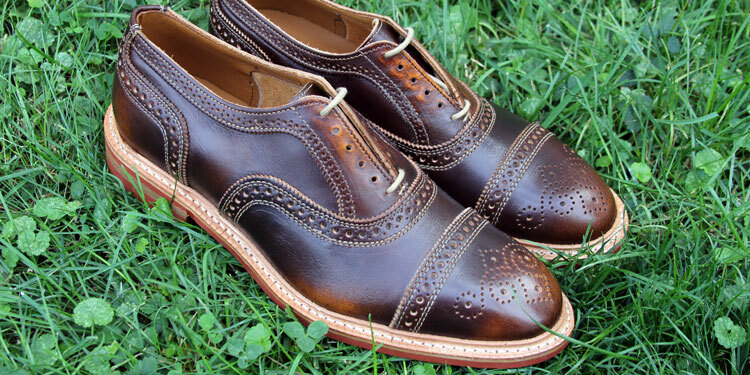 Another well-known style of brogue is the Longwing. 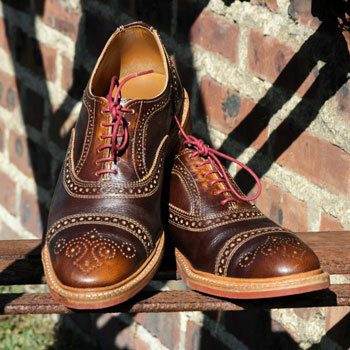 Meanwhile, wingtips are shoes which feature additional stitching across the toe that look like a bird’s wings. A largely American term sometimes used for brogues, wingtips are a more urbanised style that feature no perforations or pinking. They’re also associated with the early 20th Century. A common style of wingtip is the Spectator, which is a two-tone shoe. This can be very formal when made from monochrome patent leather. However, it can also be very casual if made from pebbled or suede leather. If you want to learn more about either shoe style, you can read either our guides on Wingtip shoes as well as Brogues. Finally, the antithesis of the Oxford is the Derby or Blucher shoe. Unlike the Oxford, which features a closed-lace system, Derbies have open laces. This means that the eyelets are found on an extra piece of leather that is fixed on either side of the throat. Because of this more primitive and rugged design, Derby shoes are inherently less formal and more casual. However, when worn properly, they can be relatively dressy and certainly usable in most business professional settings. If you want to learn more, head to our Derby & Blucher shoe guide. Reviewed by George J., on 19th September . "Absolutely delighted! I was stuck choosing between two premium shoes and this list helped me make my decision."